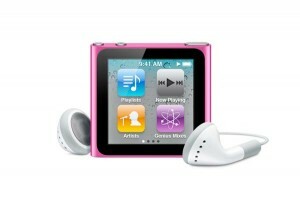 Apple filed for a patent today which may become the future of iPod devices. Up until now most iPod devices have not had any sort of quality external speaker which means users were forced to use headphones, that may all be coming to an end with a revolutionary new clip speaker design. From the patent information it looks like the clip speaker will likely be used on the iPod Nano and any other small form factor iPods. This would be a revolutionary new design from Apple and many analysts say it will definitely make a huge difference in the iPod world because it will finally allow Apple users to share their songs easily and conveniently with anyone around. No word on if or when the design will be implemented on an actual device but it will likely come sometime in the next year or two.